Blake Burzell scored 22 points against Calvary Chapel, adding to his 497 season point total, a freshman varsity record.Photo by Dante Fornaro. Blake Burzell was limited to a season-low four points against Godinez last week, but scored 22 point in the losing effort against Calvary. 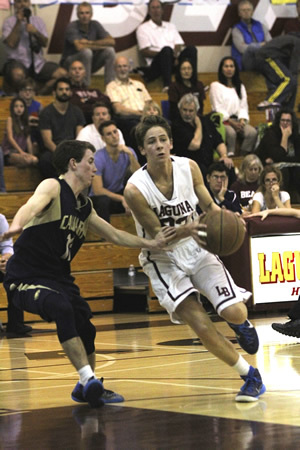 He has scored 497 season points including 44 three-pointers, a freshman varsity record in 80 seasons of basketball at Laguna. Breakers lost both league games last week to league champion Godinez 64-27 and the battle for second place to Calvary 44-43. The team hosted their opening playoff game this past Wednesday, Feb. 18, when Salesian of Los Angeles (9-17) visited Laguna. A Breaker victory would pair them up for a Friday second round game most likely with Chaminade, the third- ranked team for the division.